Interior view of the smoker in Denbigh hall. Written in blue ink on the back of the photograph is "after-lunch Denbigh-bridge etc." Twelve students sit in the room. Two play the piano on the right side. Other two watch the two students playing. Four students sit playing cards in the right in the background. On student, on the right side of the image, sits and writes on a notepad. Another student, sits across from her in a chair reading a newspaper. Two student sit near the foreground on the right side of the image. One knits while the other stares out towards her right. A duplicate of this photograph is also available. A piece of paper attached in the back indicates that this photo was a part of Bryn Mawr Yearbook, 1954. 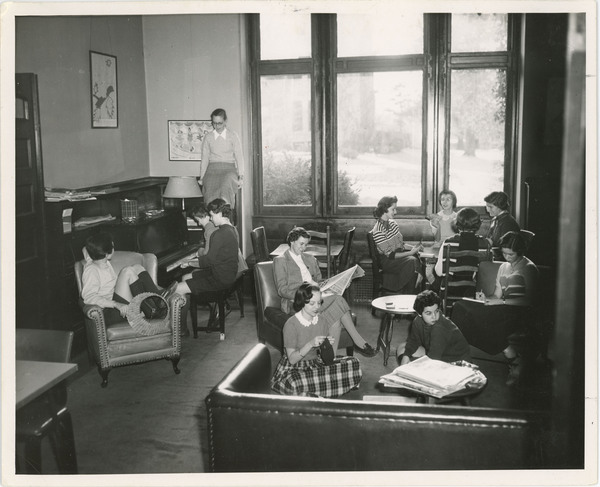 “Students in Denbigh smoker,” The Albert M. Greenfield Digital Center for the History of Women's Education, accessed April 24, 2019, http://greenfield.brynmawr.edu/items/show/2701.